A 9 oz. tin of Old Bay® Seasoned Snack Mix and a 10 oz. 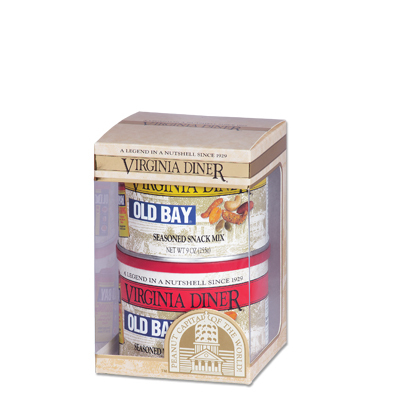 tin of Old Bay® Seasoned Peanuts ready to give in a gift box. Old Bay® is a registered trademark owned by McCormick and Company. Dec 5, 2016 | By John W.
This is the best snack mix, I have ever had! Always a pleasure. Not one negative thing to say. We receive a basket of peanuts in the shell every year for Christmas from Virginia Diner at the office and the men love them so much I decided to order more. 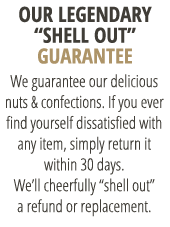 My next order I ventured out and ordered several tins of different nuts and the guys, and I, have been pleased. Thanks for always delivering fresh, delicious snacks!